There’s a whole bushel of ‘Most Dangerous Game’ films out there, tweaked versions of the same motif in which human beings are hunted for sport, and often large sums of money as well. 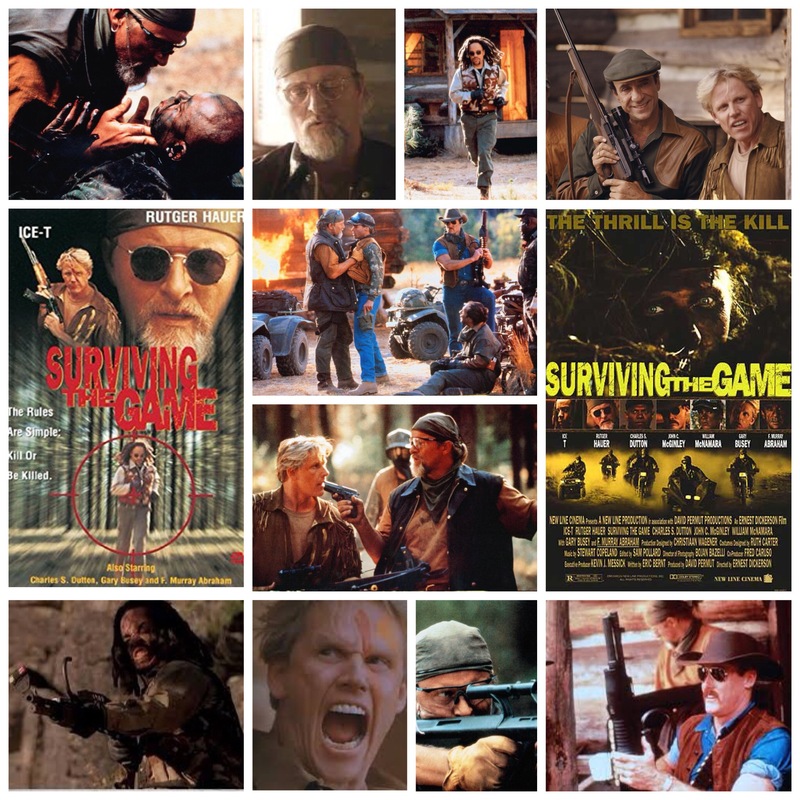 Surviving The Game is probably the most bombastic and excessive one (John Woo’s Hard Target is the way to go if you want something slicker), but it’s a hoot of a flick, a dingy, mean spirited exploitation piece with an eccentric cast and thrills right up to the last scene. Ice T stars here under a giant heap of dreadlocks, playing a grumpy homeless man who is approached by an alleged social worker (Charles S. Dutton, intense) and offered help in the form of some vague rehab program way out in the woods. Soon he’s out in the woods at the remote retreat run by a sinister ex military Rutger Hauer, joined by other oddballs from all walks of life including F. Murray Abraham and a hopelessly coked out Gary Busey, who chews enough scenery that those giant teeth of his actually go to good use. This is no sabbatical though, as Ice soon finds out, and before he knows it he’s scrambling through the wilderness for his life as Hauer & Co. pursue him with a giddy amount of heavy artillery. The film isn’t interested in the morality or ethics of it’s concept, it’s here for a down n’ dirty romp and not much else, as long as you’re in popcorn mode you’ll get a kick out of it. Hauer is intense as ever, with some inspired costume choices and that ever present half smirk that signals danger and violence aren’t far off the horizon. Busey is certifiably, completely off his head, spouting monologues that weren’t even in the script (Hauer’s autobiography provides hilarious behind the scenes insight) and staring down everything that moves in true loosey Busey fashion. Throw in a manic John C. McGinley as well and you’ve got just about as much crazy as the film can handle. The combat hunting scenes really are impressive and thrilling, well staged stunts against a wilderness backdrop and raucous gunplay all round. An oddball of a flick, in the best way.